The Canes Deer Velvet Antler supplements are ideal for joint pain relief including arthritis joint pain and hip joint pain. Canes Deer Velvet supplements contain a unique combination of nutrients used by the body in the healing and restoration of joints. It’s the only natural product where this combination actually occurs. Why Do We Need Supplements For Joint Pain? Our diet has changed dramatically over the years. The use of convenience food (pre-prepared and processed) means we no longer receive the abundance of nutrients once found in traditional cooking, including the glucosamine and chondroitin type nutrients that are found in deer velvet. As a consequence many of us are lacking in joint nutrients and are troubled by joint pain. Help yourself to healthy joints today! An inflammatory response is a complex reaction by the body to trauma, infections and injurious agents. This reaction typically includes reddening of tissues, swelling, pain and local heat. Deer velvet has been shown to have anti-inflammatory activity in laboratory and clinical experiments. This might be due to growth factors in velvet that are involved with its rapid growth. Wang (1996) has identified an ingredient in velvet that may be responsible for this activity. It is suggested that this effect is achieved without the side effects associated with anti-inflammatory drugs. There is a growing need for further research to substantiate these findings and to quantify any effect. How Can Deer Velvet Help Joints And Joint Pain? 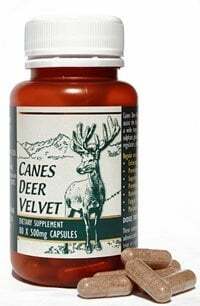 Canes Deer Velvet contains valuable nutrients to support the body in healing joint injuries and preventing degeneration of the joints such as occurs in arthritis. All of these wonderful joint nutrients occur naturally in Deer Velvet Antler, and they interact together to make it really work! A protein widely recognised for the promotion of healthy skin and hair, but also a vital structural protein found in cartilage, providing it with elasticity and shock absorbing properties, and a strong framework to hold the other cells. These assist cell function and support the body in regulating inflammation and swelling, and therefore pain. Also helpful in minimising recovery times after physical activity.